Why Haven't We Colonized Mars Yet? 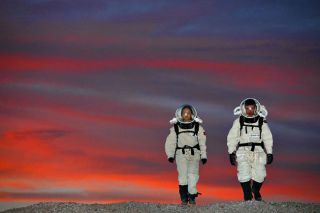 The sun sets behind two members of a mock Mars mission for one of the Mars Society's Mars Desert Research Station expeditions. Humanity has been flying in space for 50 years now, but we are still confined to a single planet — Earth. If it took only eight years to go from no humans in space to the first man on the moon, why haven't humans colonized Mars and other worlds yet? Or at the least the moon? "NASA's plan as of 1969 was to have a human Mars mission by 1981, a permanent moon base in the '80s and a permanent Mars base in 1988," said Robert Zubrin, president and founder of the Mars Society. On 12 April 1961, Russian cosmonaut Yuri Gagarin became the first human to travel into space when he launched into orbit on the Vostok 3KA-3 spacecraft (Vostok 1). Here the re-entry capsule of the Vostok 3KA-3 (also known as Vostok 1) spacecraft (Vostok 1) is seen with charring and its parachute on the ground after landing south west of Engels, in the Saratov region of southern Russia. Still, the main reason that people have not yet voyaged past the orbit of the moon is mostly a political one. The era of human spaceflight began on April 12, 1961, when the Soviet Union shocked the world by launching cosmonaut Yuri Gagarin, the first man in space, into orbit. At the time, the so-called Space Race was under way, with the United States and Soviet Union both working to land a human on the moon first. That race ended with NASA's historic Apollo 11 moon shot, which landed astronauts Neil Armstrong and Buzz Aldrin on the lunar surface on July 20, 1969. "The Cold War is over," said Bill Nye, executive director of the Planetary Society. Back in the early days of human spaceflight, the United States and Soviet Union were locked in the Cold War, a life-or-death struggle that spurred the space race for control of the ultimate high ground. Since then, however, "we've had a major failure of political leadership in this country when it came to human spaceflight," Zubrin said. "It'd be like Columbus coming back from America and Ferdinand and Isabella saying, 'so what?'" "You can say it's risky, but imagine all the risks human spaceflight faced in the beginning," Zubrin said. "When Kennedy gave his speech in May of 1961 about putting a man on the moon, we had 15 minutes of human spaceflight experience, and yet we went." "My uncle landed on Normandy beach," Zubrin said. "They didn't hold up the Normandy landing until they knew it was safe. If you're going to wait to go to Mars until it's going to be safe, you're never going to Mars." The goal now "is toget people to realize the value of human spaceflight," Nye said. "When we explore with robots, we make discoveries, but not nearly as fast as with people, and not in the same engaging way." "This is really a challenge of who we are, what kind of people we are," Zubrin said. "Are we willing to accept challenges and embrace risk? Or are we ultimately resigning from our role as a nation of pioneers?"